Feeding a crowd? 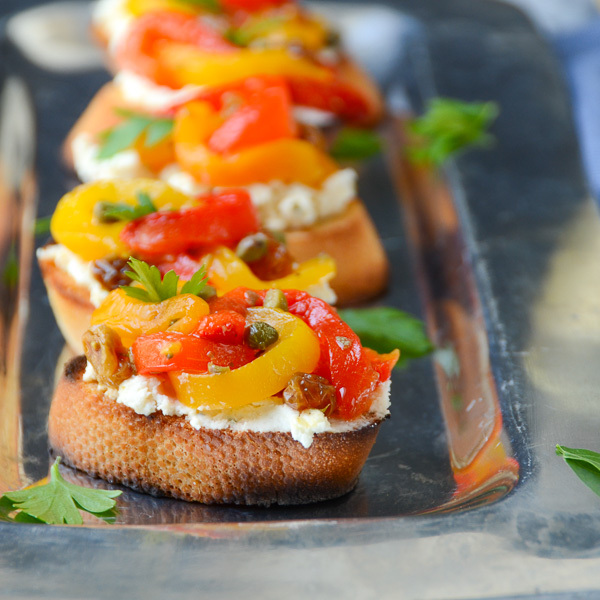 Crockpot appetizer recipes are the way to go. 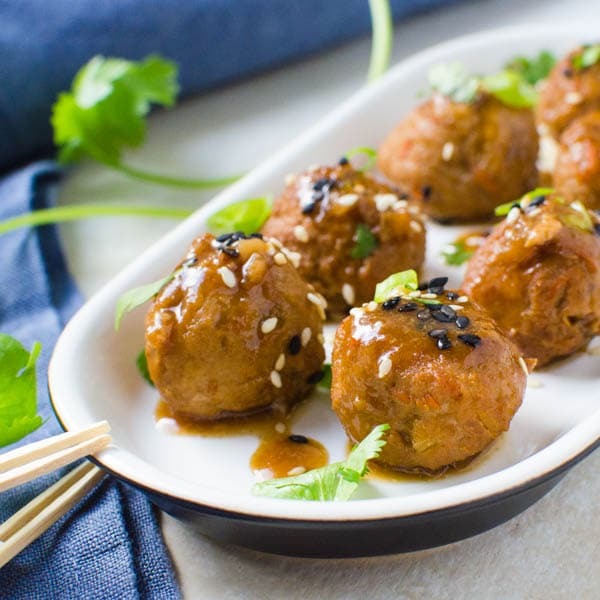 Asian pork meatballs are easy to make, juicy and flavorful. 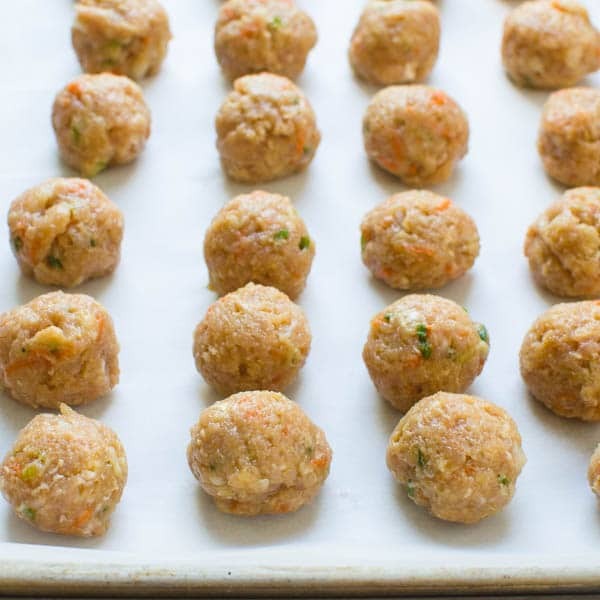 This Asian meatball recipe makes enough for your next party! 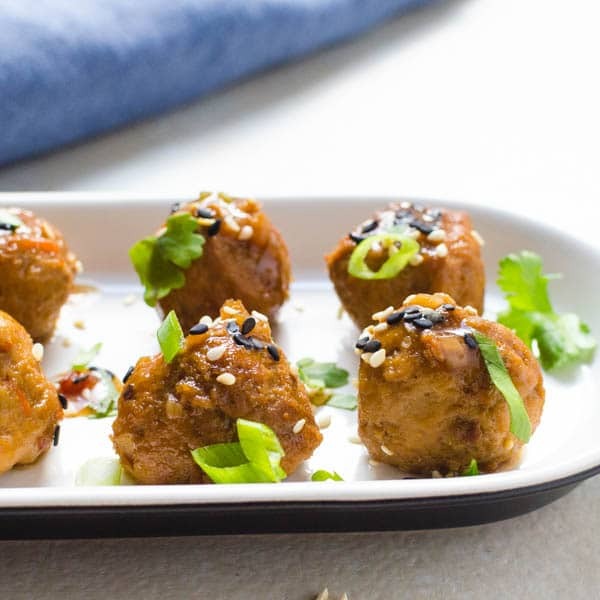 If you’re having a party, these Asian pork meatballs need to be on the menu. 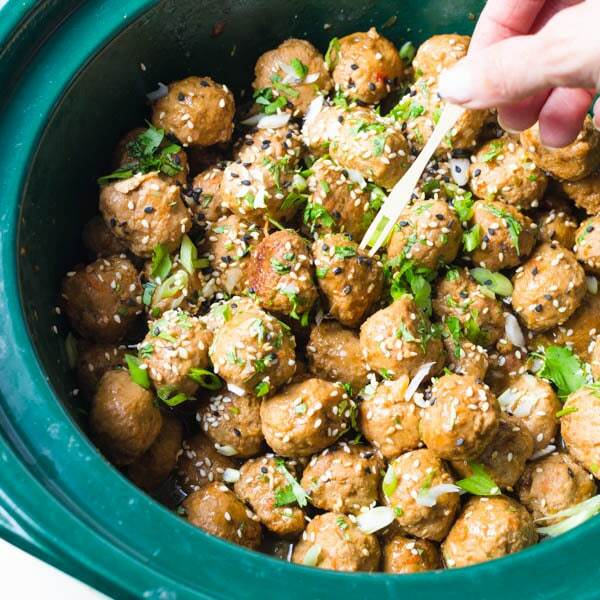 The flavor is SPOT ON and this Asian meatballs recipe makes a metric ton (or one large crock pot full). 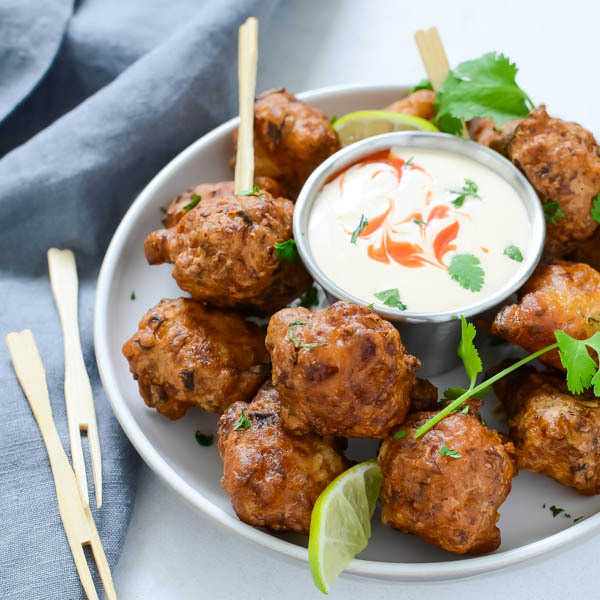 These savory cocktail meatballs are absolutely delicious and as with any vat of meaty orbs, they’re a hit at any gathering. Let’s be honest, easy crockpot meatballs are a universal favorite but rather than go with the traditional grape jelly/chili sauce blend or those Ikea-esque Swedish meatballs, I wanted something with more oomph. 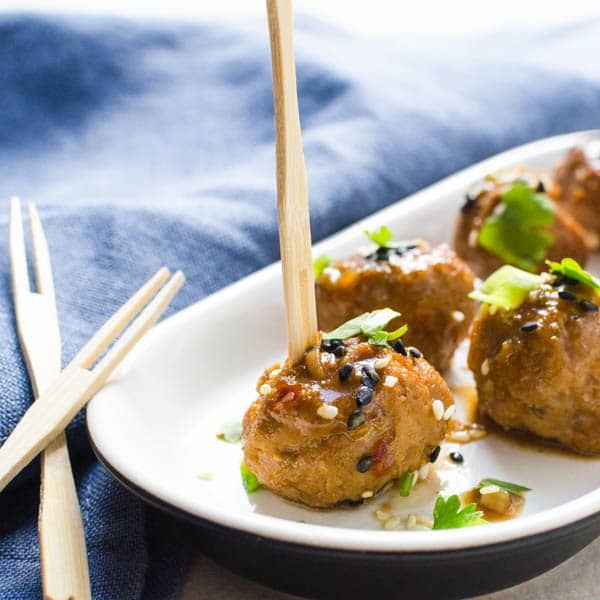 This Asian meatballs recipe starts with a panade (bread soaked in milk) and gets layered with Asian flavors like sesame oil, soy sauce, ginger, hoisin and water chestnuts for a tender meatball with a noticeable Asian bite. 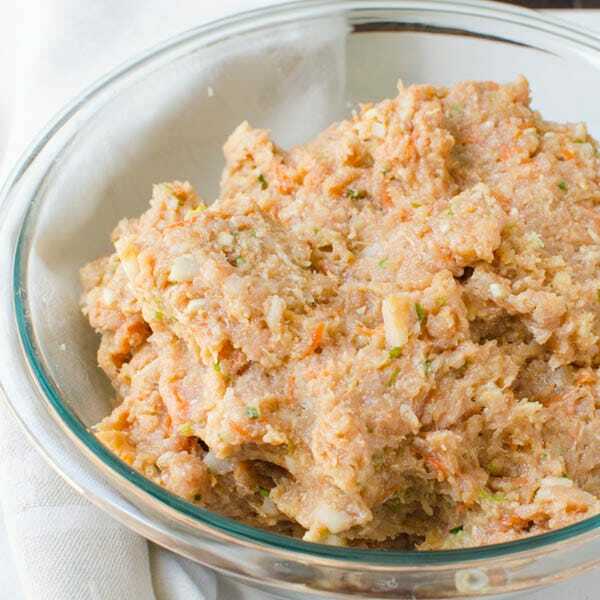 Use your clean hands to mix the pork mixture so that all the ingredients are evenly distributed throughout. 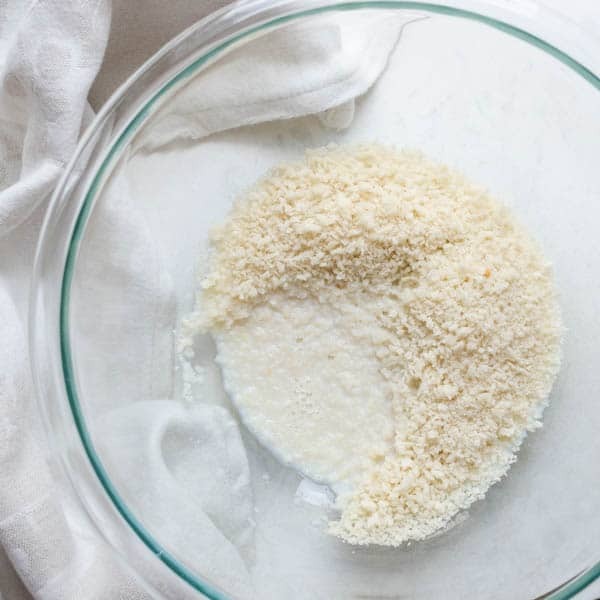 In a large bowl, combine the milk and panko and let sit for 5 minutes so the breadcrumbs absorb the milk. Drain the water chestnuts and finely grate half of them. Finely chop the other half.Add the pork, eggs, garlic, ginger, green onions, carrot, jalapeño, soy sauce, sesame oil and hoisin to the panko. 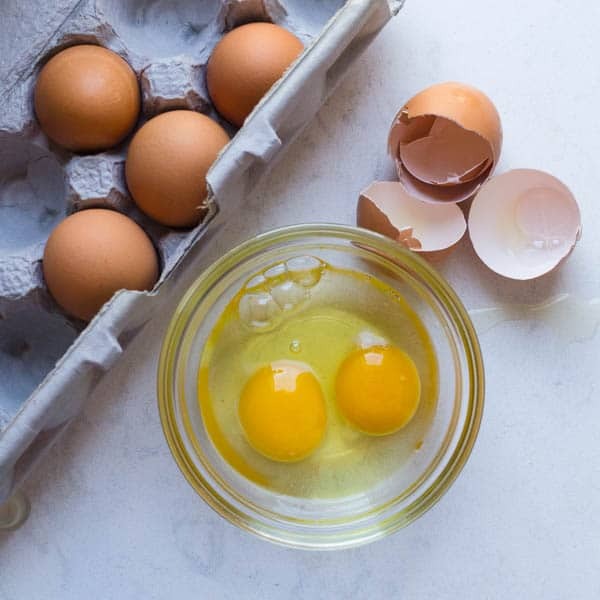 With your clean hands, mix very well until ingredients are incorporated evenly.Fill a small bowl with water. Using a small (2-3 teaspoon ice cream scoop) measure out the meat and roll into balls. 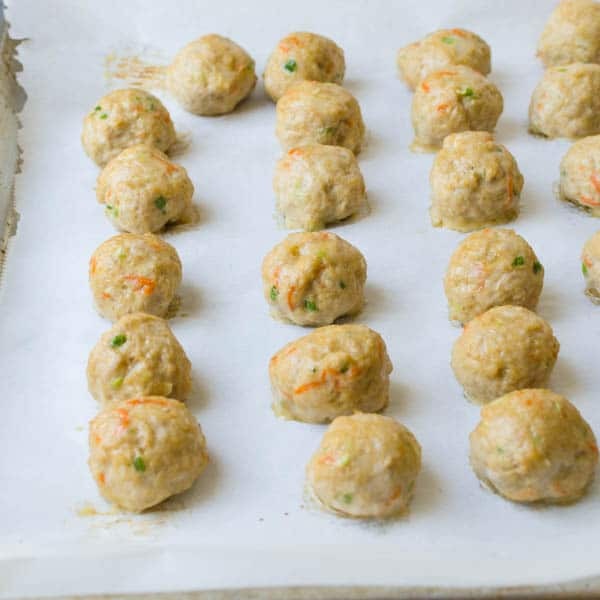 Place the meatballs onto the parchment paper. 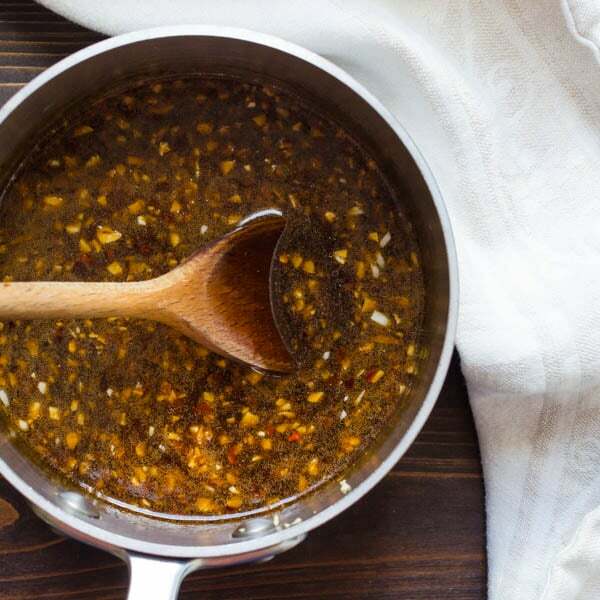 In a small saucepan, combine the brown sugar, garlic, ginger, soy sauce, hoisin, rice wine vinegar, sesame oil and red pepper flakes. Bring just to a boil, then reduce heat and simmer for 2-3 minutes. Transfer the meatballs to a crock pot and pour the sauce over. Simmer for 30 minutes on low heat, stirring carefully once or twice to make sure they’re bathed in the sauce. Sprinkle with chopped green onion, cilantro and sesame seeds. Let guests spoon out the meatballs – or offer cocktail forks. I use my favorite small cookie scoop to portion out uniform orbs, that way, I’m assured of a quick and even cooking time. The sauce is ready in just a few minutes and it gets poured over the crock pot Asian meatballs for extra zing. A liberal sprinkling of green onions, sesame seed and cilantro are the final flourish on this pot. Make sure you keep a serving spoon alongside the crock pot as well as appetizer forks for skewering the Asian Pork Meatballs. 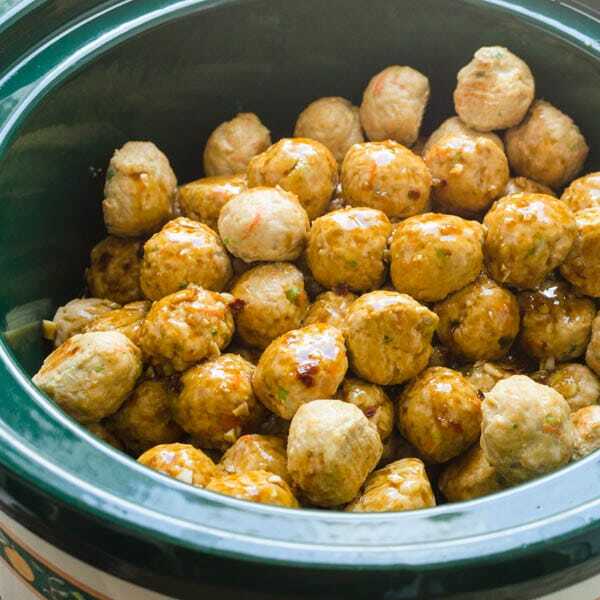 The steady stream of party-goers never waned around these easy crockpot meatballs. I was so glad I did the work ahead of time, so I could enjoy the festivities instead of being cooped up in the kitchen all night. 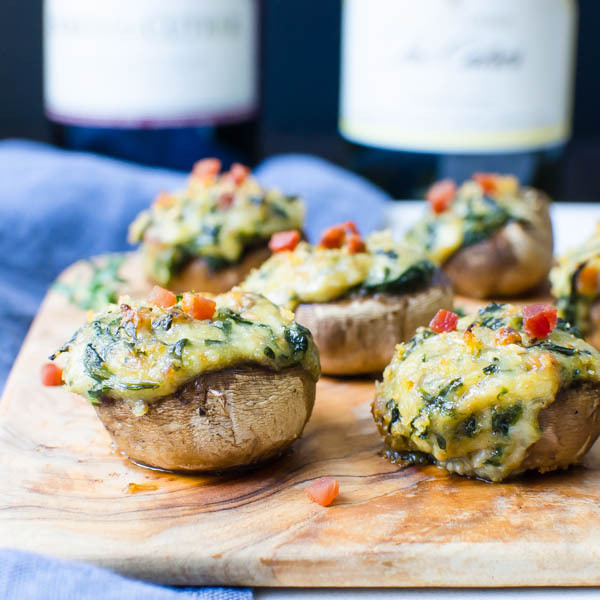 This recipe can be halved for a smaller group and I’ve also given instructions to do these as a passed appetizer instead of in the crockpot. 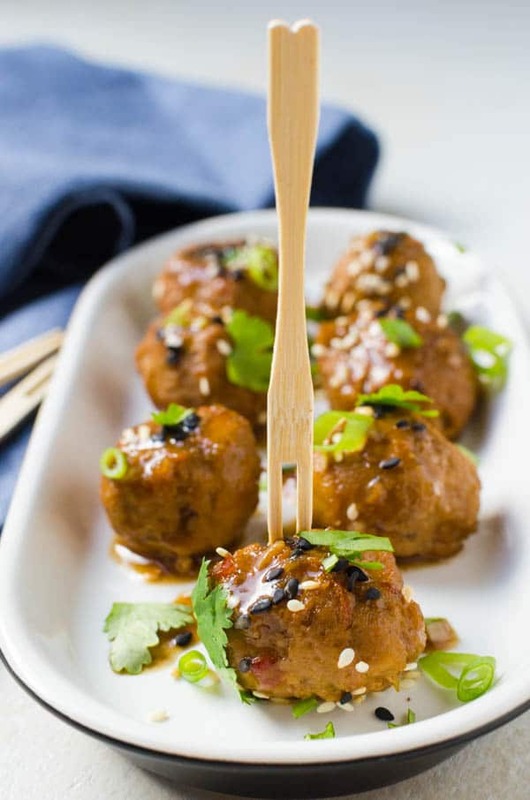 Great for a party, these Asian pork meatballs with sweet, tangy glaze are the hit of the occasion. Preheat the oven to 400°. Line two half sheet pans with parchment paper and set aside. Drain the water chestnuts and finely grate half of them. Finely chop the other half. 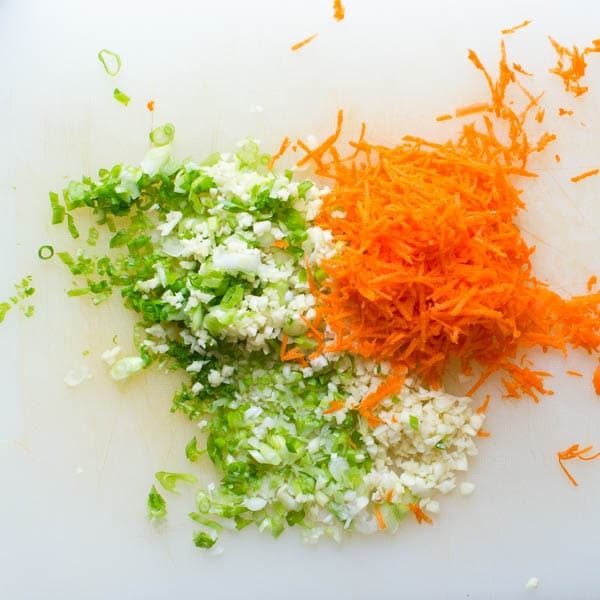 Add the pork, eggs, garlic, ginger, green onions, carrot, jalapeño, soy sauce, sesame oil and hoisin to the panko. With your clean hands, mix very well until ingredients are incorporated evenly. Fill a small bowl with water. 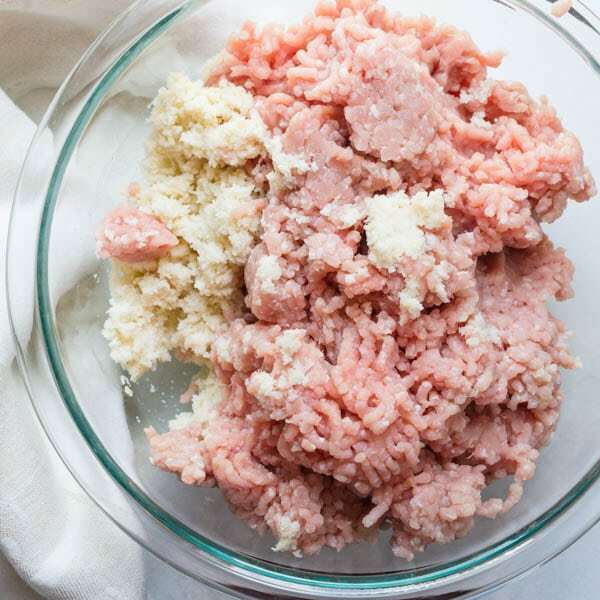 Using a small (2-3 teaspoon ice cream scoop) measure out the meat and roll into balls. Place the meatballs onto the parchment paper. Transfer the meatballs to a crock pot and pour the sauce over. Simmer for 30 minutes on high heat, stirring carefully once or twice to make sure they’re bathed in the sauce. Sprinkle with chopped green onion, cilantro and sesame seeds. Let guests spoon out the meatballs – or offer cocktail forks. 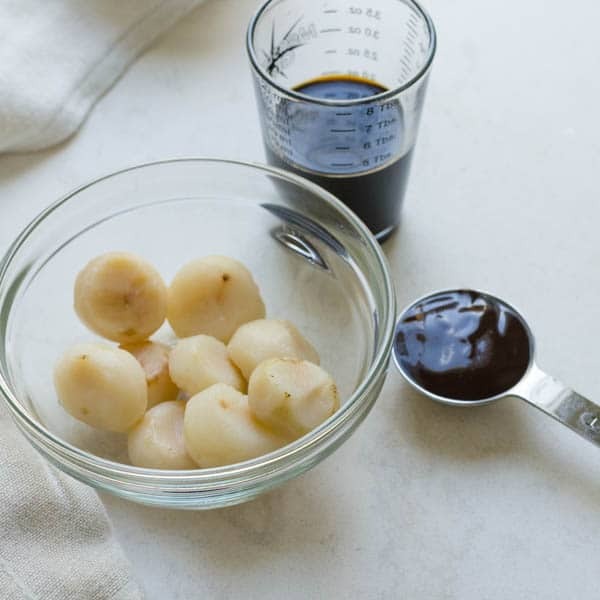 Coat the meatballs in the marinade and transfer back to the oven for 3-4 minutes or until glazed and sticky. Sprinkle with chopped green onion, cilantro and sesame seeds. Arrange on a platter and serve with cocktail forks or toothpicks. 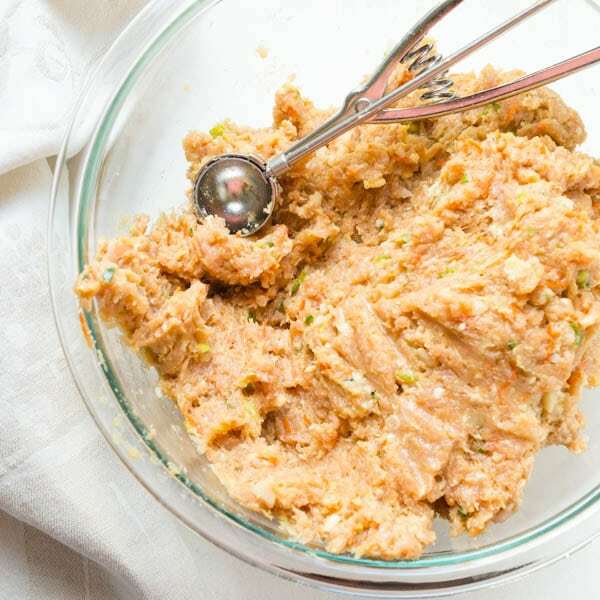 I don’t usually feed a crowd, just 2 people, but I am trying to make large batches of food that I can pull out of the freezer and cook in a few minutes for days when I forget to plan (and make) a meal. Things like standard frozen foods, but homemade and delicious. How well do you think this would work freezing it after the initial bake, before the saucing? I love these! Pretty and the Asian twist makes them unique! I bet you could freeze the meatballs ahead for even more convenience! These sure do sound delicious. 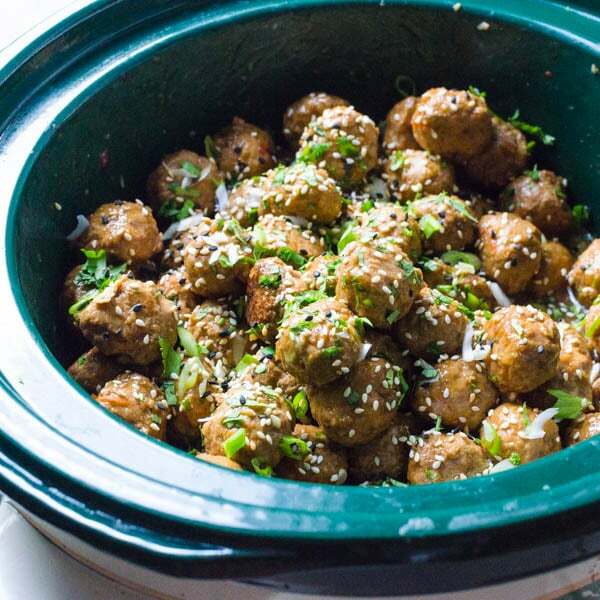 I love to make asian meatballs, but have never tried them in the crockpot. Totally giving this a shot! Love this recipe. Pinning it for later reference. Love orientalist flavours and can see my kids eating this. I will take 100 please! I am loving that Asian flavor! They look so delicious! These meatballs along with the sauce look absolutely scrumptious. Wouldn’t mind having these for our next backyard party.